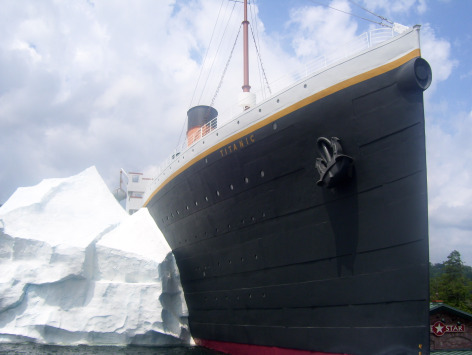 You have to experience the Titanic Museum in Pigeon Forge to believe it. It is 30,000 square feet of history, hands on exhibits, hand written letters from crew and patrons aboard this beautiful, but fateful ship. The museum building itself is a reproduction of the ship Titanic, and is very impressive from the street above and especially when standing right up next to it. They even have a replica of the iceberg as they collide with each other. Do you like a good mystery at sea? Would you like more answers to the sinking of the Titanic? The owner of the new and exciting Titanic Museum in Pigeon Forge was one of those people who couldn't get enough of the mystery behind the Titanic, so he started to gather information, artifacts, letters and ... the rest is history! We ordered tickets online before we left from home, and now were very glad we did! By the time we arrived to pick up our "boarding passes" at 2:00, the tickets were sold out until the 5:00 boarding later that afternoon. When we stepped in line outside the attraction, we were given a boarding pass. Each boarding pass was written with factual information about a person who was aboard the Titanic on this voyage. We were to read on through the exhibit, and find out if the person on our boarding pass lived, or died aboard the ship. Once we entered, the "boarding process" began in the interior ticketing area. This is where the captain spoke welcoming us to our voyage on the Titanic Museum in Pigeon Forge. We then entered through the ships ticketing area and started our journey. During your self-guided tour, costumed crew members are scattered throughout the ship, ready to introduce you to stories of some of the original passengers and crew that were on board, as well as answer your questions. Steve's boarding pass was Father Browne, a Jesuit priest who ended up surviving because he got off at the third port of call. He was a photographer and snapped some of the most real and impressive photos in the exhibit. In fact, it seemed that a good majority of the photos in the museum were taken by Father Browne. My boarding pass was a woman, who, had her two grown children aboard the ship with her. They were first class and stayed in one of two of the largest suites aboard the ship. I had to wait until the end of the exhibit to find out that she and her daughter survived, but her son, gave up his seat on the life boat to another person. Just one of hundreds of stories of true heroism. About ten minutes into the Titanic Museum in Pigeon Forge, I turned to Steve and said, "this is like a Smithsonian museum exhibit". Along the way, we encountered people who played out a short part in the history of this ship. For example, the captain told us of a hero's story and there were many of them. Did you know the Titanic carried mail from all the ports and that they staffed five postal carriers all of whom were lost at sea trying to save as many bags of mail as possible by hauling them upstairs and off the ship. These are, amazing, true to life stories. There are hundreds of displays and replicas of actual rooms of the first, second, and third class sleeping quarters. They also display the first class dining area which is beyond what one would think might be available on a ship in this time era. The centerpiece of the museum is a beautiful replica of the original “Grand Staircase” area. 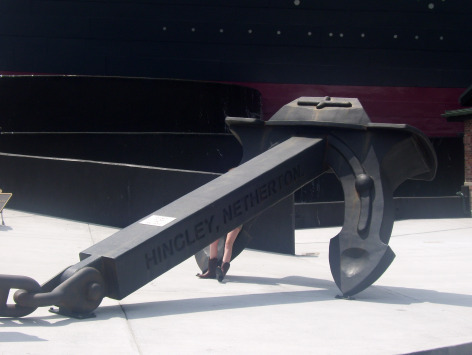 My favorite part about the museum was the area where you, the passenger is standing outside on the bow of the ship. They have a replica here of an iceberg to touch, feel how cold the air temperature is and then actually touch the 30 degree ocean water. I put my hand in for less than a minute and it was already starting to feel numb. One can only imagine being partial submerged in this water. At the end of the tour, you'll see a memorial room with a list of survivors and those who perished at sea. Most of whom perished of the conditions in the water. All I can say is, if you are in the Pigeon Forge area, the Titanic Museum in Pigeon Forge is a must see and do. And, we saw several families board with children that seemed to have found several interactive areas to occupy their visit. There is a lot of reading so bring those readers along! It took Steve and I over two hours to go through this exhibit and it was worth every minute of our time and every penny we spent. I would suggest calling ahead for reservations because they board the ship (museum) at specific times in order to stagger the amount of people inside. Allow a few hours, but it goes very fast because it's all so fascinating. Bon Voyage' and enjoy the trip! 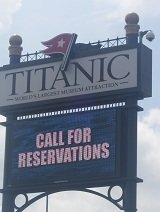 When you arrive at the Titanic Museum in Pigeon Forge, your E-Ticket reservation vouchers will be exchanged for your selected theater show, attraction or lodging preference. It’s similar to how the major airlines handle online ticketing. The benefit of using E-Ticket reservation vouchers is that you can always reprint them from this website if they are misplaced by a simple login to your account - click on orders - and reprint.